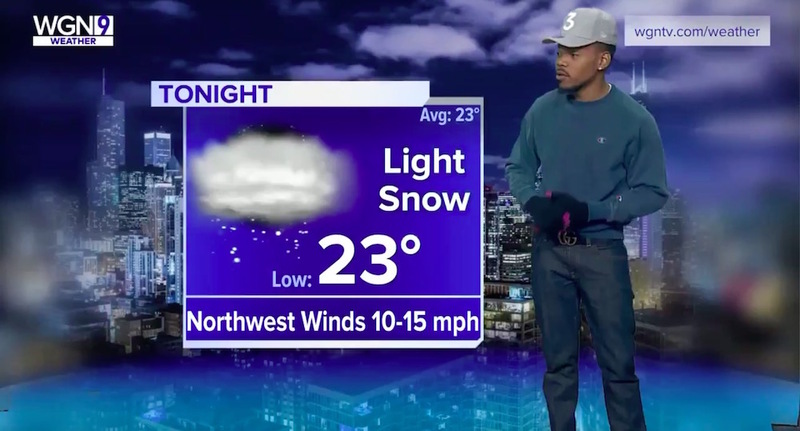 We’re not sure that there’s anything Chance the Rapper can’t do — including being a weatherman. The musician stopped by WGN Morning News in his hometown of Chicago on Friday. And while there, he tried his hand at meteorology, delivering a hilarious account of the weather. Chance, who is a vocal advocate for Chicago youth in the city, was there in honor of the 15th annual WGN Morning News Toy Drive. The annual effort collects gifts for disadvantaged children during the holidays, and this year WGN teamed up with Chance’s youth empowerment charity, SocialWorks. The rapper is truly a champion for the city of Chicago. This year, Chance raised more than $2.2 million for Chicago Public Schools. And in November, he spoke to the Chicago City Council, urging reallocating funding to education. “It’s extremely cold outside, but it hasn’t seemed to stop the spirit of giving,” he said before gearing up to start his weather report. In true Chance fashion, he put his own spin on it, but not without some words of wisdom from weatherman Paul Konrad. Chance the Rapper was, of course, a natural on screen. At one point he even appears with an “invisibility coat” that makes him disappear into the map. “If I have to check out books from the Hogwarts library, I can do that!” he exclaimed. From offscreen, Konrad complimented him on his form, and you can hear the rest of the crew laughing at Chance’s inspired rendition of the weather. He even left us with a profound statement, inspired by the forecast of snow. We think Chance may have found his true calling — and others agree.